I’ve been getting sir’d a lot these days. At Best Buy. At the pharmacy. I had been on a ma’am streak for awhile. What changed? I haven’t lost or gained weight. I’ve been wearing the same clothes that I always wear. I hadn’t been able to figure it out. Until I was looking in the mirror. And noticed that my hair is at that in between stage. Not short and spiky like with a fresh cut. Not so long that it needs cut. 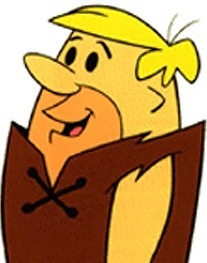 Yep, I’ve got Barney Rubble hair. I guess there are worse looks. So, I’ll rock what I’ve got. At least until it’s time for a haircut. This entry was posted in Being Butch, Gender and tagged butch, cartoon characters, gay, gender, genderqueer, haircut, lesbian, transgender. Bookmark the permalink. Hey, Barney, You know I’d give anything to be sir’d over and over! I’ll be at the barber when they open at 9:00a.m.! Enjoy that fresh haircut, bro.